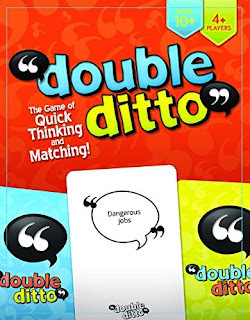 Savvy Spending: Amazon: Double Ditto Party Game for just $11.97 shipped! Amazon: Double Ditto Party Game for just $11.97 shipped! Amazon has the highly rated Inspiration Play Double Ditto Family Party Board Game for just $11.97 shipped when you use promo code WEPLAY40 at checkout. Check out the 5 star reviews! This game won "Game of the Year" in 2016! Make a great gift idea! Ran out of stock earlier this year but BACK IN STOCK now! Pick a card, read it out loud, and then quickly write down 2 answers you think other players will also write. Laugh or cry as you discover whether you were able to match any answers with other players. Find out whose mind is in sync with yours. It may not be who you expect!